According to a sixteenth-century Spanish manuscript, the Mexicah (Aztecs) drank a tasty and nutritious drink they called chocólatl. However, the writer, Francisco Hernández, cautioned that: “they say that it puts on extraordinary amounts of weight if it used frequently”. Hernández discovered chocólatl during a seven-year expedition to explore the natural history of the colony of New Spain (present day Mexico). He had been sent there by Philip II of Spain in 1570 and spent his years in the New World exploring, cataloguing, drawing and collecting. Unusually, he not only took the trouble to learn the indigenous language, Náhuatl, but also translated his own work back into it, so that the local people who had helped him to gather information could also read what he had written. Hernández returned to Spain in February 1577 with thirty-eight volumes of notes, plus drawing and specimens. Sadly, very little of this was published in his lifetime and much was destroyed when the Spanish Royal Library burned down after his death. Fortunately, a few manuscript copies of his work circulated and some extracts were published, so today now have good editions of much of what he wrote. 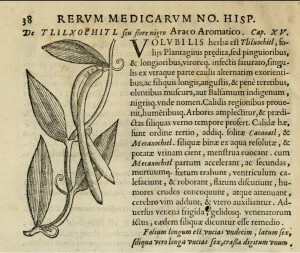 Among the many strange and wonderful new plants Hernandez described was one that the local people called tlilxóchitl (pictured, from the first printed edition of Hernandez’s work), the flower we now call vanilla, which was the first New World orchid to be described in Europe (although, as we shall see, it wasn’t recognised as an orchid until much later). As with many of the plants he described, Hernández (who was Philip Il’s doctor), was interested in the medicinal properties of tlilxóchitl. According to which version of his texts you read, vanilla could be mixed with several other things (from other flowers to “the tail of the opossum”) and then “introduced into the uterus, is an excellent remedy for sterility”. It was also good for stomach ache and poisons, “expels flatulence” and (thankfully, given the previous use) was highly aromatic. However, one important property of vanilla is missing from this account; in the centuries that followed, it was widely believed that vanilla was an aphrodisiac. This story can be traced to one of the earliest accounts of chocólatl, Bernal Díaz del Castillo’s True History of the Conquest of New Spain (Historia verdadera de la conquista de la Nueva España). Díaz del Castillo, who was a foot-soldier in Cortes’ army, recorded that the Aztec emperor, Moctezuma II drank chocolate flavoured with vanilla and that his servants “brought him cups of fine gold, with a certain beverage made of cacao, that they said was for success with women”. Two things are unclear about this. Firstly, it’s not clear whether vanilla or chocolate were considered aphrodisiacs, or if it was the combination of the two. When Hernández described chocólatl he recorded that, “the property of the drink composed is to excited the sexual appetite”, which suggests that the mixture was the key, not the vanilla on its own. ground to powder; and when pulverised put them into the chalice of the well-known and very fragrant flower huacalxochitl [“basket-flower”, probably a species of xanthosoma, a relative of Arums], so that they may catch and inhale the very redolent odour of this flower. Finally, take the much praised flower yolloxochitl [“heart-flower”, the Mexican magnolia, Talauma mexicana], hollow it out suitably, then put in the hole this health-bringing powder, and hang the little receptacle around the neck. However, the recipe is for something called the “traveller’s safeguard” and there’s no hint that it had aphrodisiac properties. It would seem that if the Aztecs believed vanilla to be an aphrodisiac at all (which is not clear) it was only when mixed with chocolate. Yet, by the eighteenth century, the aphrodisiac properties of vanilla were widely accepted in Europe. 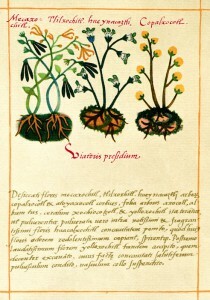 For example, it is claimed that the German physician Bezaar Zimmerman published a treatise entitled “On experiences” (1762), in which he claimed that “no fewer than 342 impotent men by drinking vanilla decoctions, have changed into astonishing lovers of at least as many women” (although, as with so many orchid stories, I’ve been unable to trace a source for this one). Europeans mistranslated the name tlilxóchitl as “black flower” and for many years, believed the vanilla flowers were black (they’re in fact a creamy white); it was the black seed pods, from which vanilla essence is still made, that were the source of the Náhuatl name. 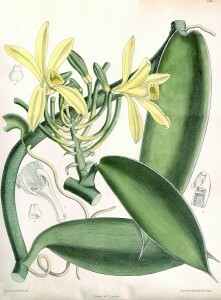 Because European scientific names were for many years based on the form of the plant’s flower and no European had seen a vanilla flower (or at least, hadn’t connected one to the little black pods), it was impossible to recognise vanilla as an orchid. So, did vanilla become a supposed aphrodisiac in Europe because it had finally been recognised as an orchid and orchids traditionally had that power? Or did the indigenous people of central America have that belief, and pass it on to their conquerors? And, if it was the latter, could the common aphrodisiac properties of vanilla and the European orchids have helped European naturalists to recognise that the orchids were a natural family of flowers? I’m still not sure. In the meantime, I’m going to have some vanilla ice-cream, sprinkled with chocolate. Just in case it’s all true. Next Next post: Fame at last?